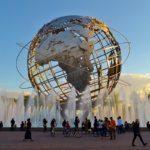 The renovation of Flushing Meadows-Corona Park in Queens continues apace, with a recently announced renewal of the World’s Fair fountains surrounding the iconic Unisphere. 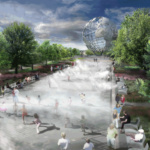 Landscape architecture firm Quennell Rothschild & Partners (QRP) has been selected to spearhead a $5 million renovation of the Fountain of the Fairs within the park, and will link the neglected fountains with an interactive “fog garden”. 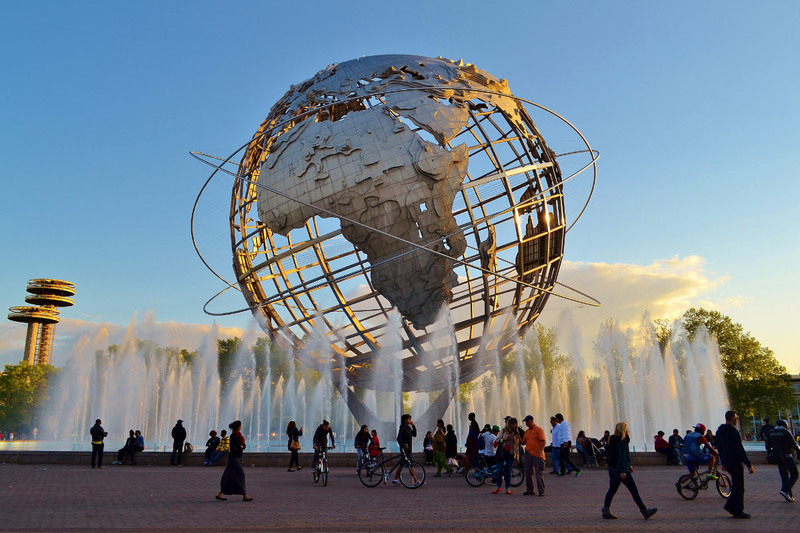 The Fountain of the Fairs, an axis of long, rectangular pools designed by Robert Moses for the 1964-65 World’s Fair, connects the Unisphere to the Fountain of the Planets to the east. Instead of returning the three fountains to their original conditions, QRP will be updating each of them to allow community access as well as save water. 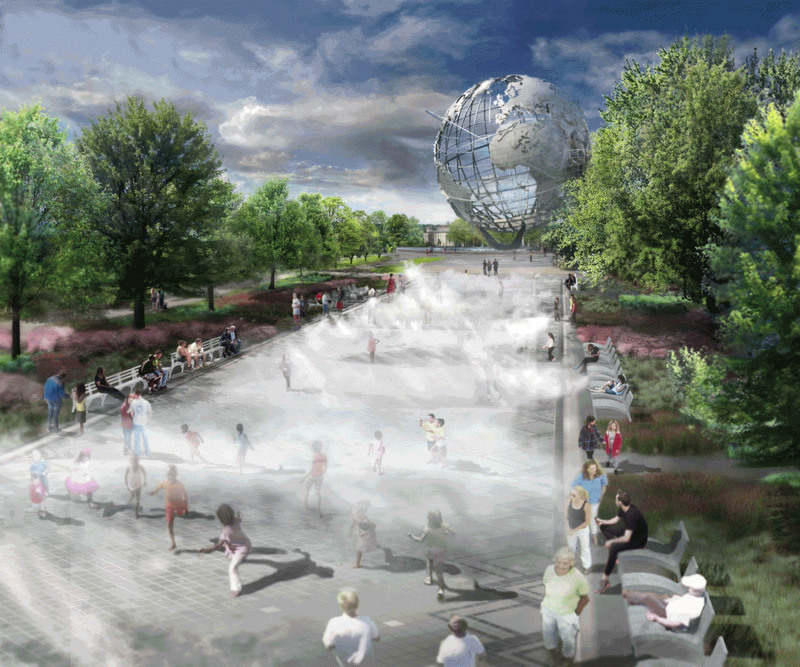 In the first phase of the plan, the western pool in front of the Unisphere will be filled in with Art Deco-inspired pavers and converted into a fog garden. 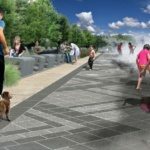 The walkway’s fog will be generated by a series of 500 hidden sprinklers, and NYC park officials can either create a four-foot-tall fog wall or release the mist in waves to improve the visibility. As the children play in the garden, parents will be able to watch from the new concrete benches lining the play area. 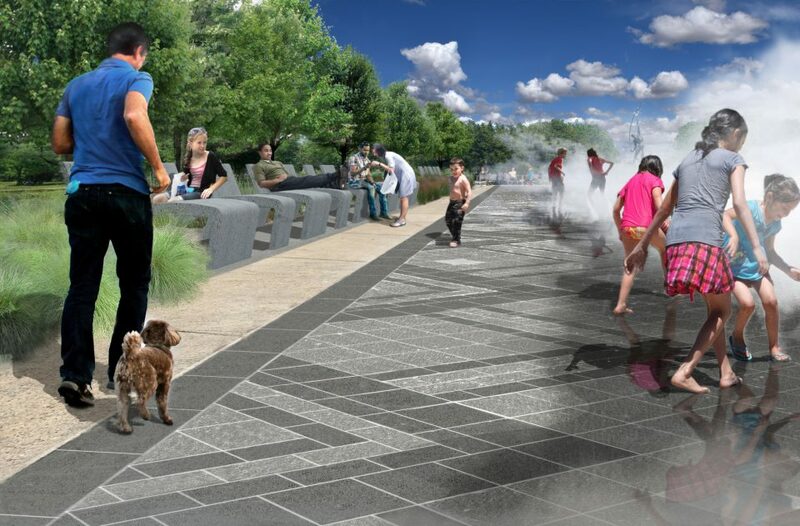 Phase II will see the middle fountain converted into a sunken amphitheater, and the final phase will create a children’s water park in what is currently the easternmost fountain. QRP will also be replacing the massed Yew trees along the fog garden area with maple trees, short evergreen plants, and grasses to improve the views across the park. The new sightlines will also allow food trucks to park in the newly softened plaza in front of the Fountain of the Planets. The renovation is a welcome respite for the Fountain of the Fairs. Although all three fountains were repaired and flowing after a renovation in 2000, the pools have been dry since 2012 due to flood damage from superstorm Sandy. 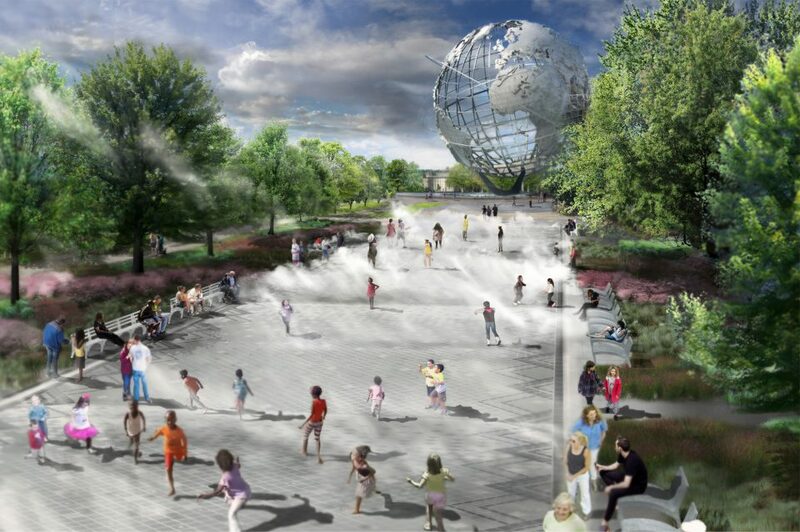 Any visitor to Flushing Meadows-Corona Park might spot children cooling off in the fountain below the Unisphere, although the basin is meant to be purely decorative. 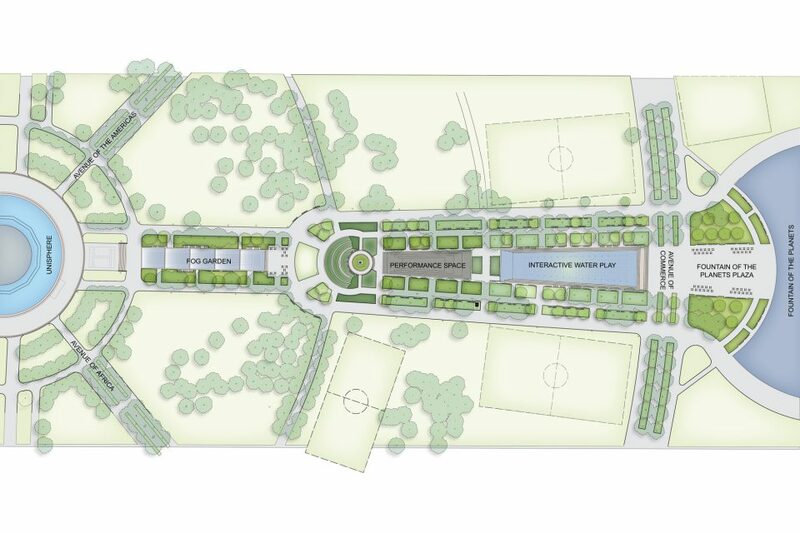 The fountain plans comes on the heels of the revitalization of the Philip Johnson and Richard Foster-designed Tent of Tomorrow, which was restored to its original color in 2015, and which recently won $14 million for structural upgrades. Construction on the first phase of the fountain conversion will begin in the fall of this year.